Markets can't defy gravity for ever and Tuesday's early tone is clearly downbeat. 1. Fed meeting begins: Policymakers at the U.S. Federal Reserve start a two-day meeting. Fed chair Janet Yellen will deliver her latest assessment of the economy and plans for policy on Wednesday after the meeting is over. 2. Weak start: U.S. stock futures were declining ahead of the open and all major European markets were in the red in early trading. U.S. stocks closed mixed Monday. The Dow was up 44 points. 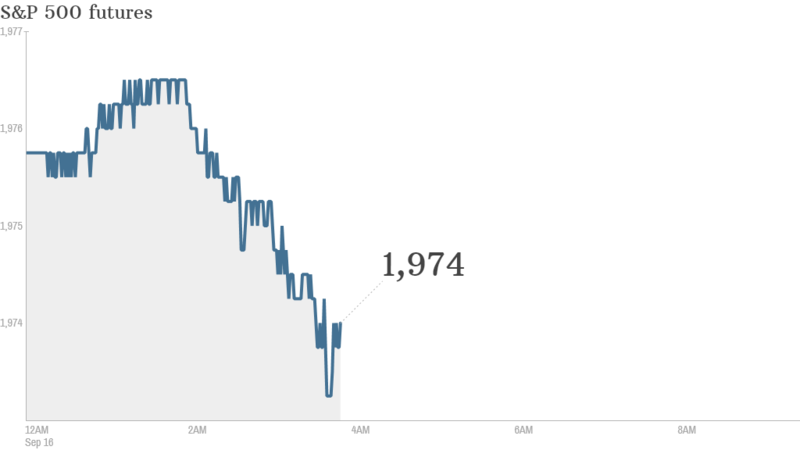 But the S&P 500 slid 0.1% and the Nasdaq was 1% lower. Shares in major tech companies took a big beating Monday. Tesla (TSLA) shares dropped by 9% after a Morgan Stanley analyst wrote a note saying the automaker's steady rise over the past two years won't go on forever. 3. Anticipating Alibaba: Yahoo (YHOO) was yet again the standout premarket performer. Shares were rising by about 1% ahead of the open after Alibaba said it was raising the price range for its initial public offering. Alibaba shares are expected to start trading on the New York Stock Exchange under the ticker "BABA" later this week, and that will mean a massive windfall for Yahoo, which owns a large portion of the Chinese e-commerce company. 4. Ruble trouble: The Russian ruble continued declining versus the U.S. dollar to hit an all-time low as money continues to flow out of the country. One dollar will now buy you nearly 39 rubles. Russia's currency, stock market and economy have been suffering as Western nations impose harsher sanctions against Moscow over its support for separatist rebels in eastern Ukraine. 5. Economic data: At 8:30 a.m. ET, the Bureau of Labor Statistics will release August data on producer prices. This data gives a good indication of trends for price inflation for consumers. Then at 10 a.m., the U.S. Census Bureau will release findings from its annual report on income, poverty and health insurance.